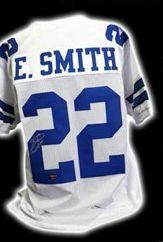 2016 Leaf Autographed Football Jersey offers collectors an opportunity to find signatures from past and present NFL stars. Each box includes one autographed custom jersey. Bringing another group of talented athletes, 2016 Leaf Autographed Football Jersey adds to the list of players from the 2015 product. Pro Football Hall of Fame signers include Terry Bradshaw, Walter Payton, and Johnny Unitas, while signed jerseys by current gridiron stars include Drew Brees, Cam Newton, Odell Beckham Jr., and Ben Roethlisberger. 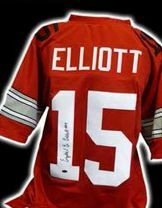 Young talents can also be found in the 2016 Leaf Autographed Football Jersey repackaged product, such as Ezekiel Elliott, the fourth pick from the 2016 NFL Draft, and top overall picks from 2015 with Marcus Mariota and Jameis Winston. Collectors should note these are not officially licensed NFL jerseys, rather, the sealed mystery boxes contain an autographed jersey without team logos. These are images included on the sell sheet. Contents are subject to change. Have not seen any big names. Have seen Fouts, Renfro, Little, to name a few. Not much on an Ebay search. The Jerseys don’t seen to be Replicas, the Renfro I saw was like a practice jersey.